Keep little feet toasty warm with these simple, crocheted baby slippers. This is an easy crochet pattern that uses basic stitches and simple shaping. This classic slip-on design works well for baby girls and boys; just switch the colors to reflect your little one’s style. When worked in the autumnal colorway, these slippers are part of the Sweet Potato Baby Layette, a matching pattern set that includes crochet patterns for a baby blanket, sweater, square-top hat, and beanie. 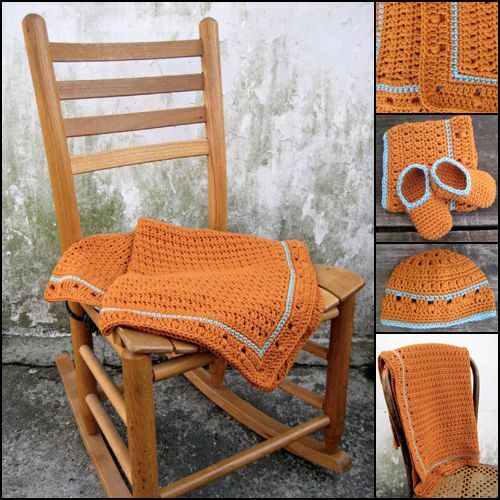 This is a great gift set to make for babies, as well as a great way to learn how to crochet baby slippers. Need matching slippers for Mom? Here is a good adult crochet slippers pattern. This beginner crochet pattern uses single crochet and chain stitches with some shaping techniques that most crocheters will find easy. Any worsted weight yarn can be substituted for this project. A machine washable fiber is always highly recommended for baby items. Check the yarn label for care instructions before purchasing. You’ll need approximately 48 yards (22 grams) of your main color to make the largest slipper size. Crochet Hook: US size G/4.5mm hook. Adjust hook sizes as necessary to achieve gauge listed below. Extras: Tapestry needle for weaving in ends. Ages are given as a reference. Choose a size based on actual body measurements whenever possible. If you’re unsure of a size for a baby it’s always safest to go up a size so that they can grow into the item. The pattern is written for smallest size with changes for larger sizes in parenthesis. When only one number appears it applies to all sizes. This pattern is worked both in rounds and then in rows. Rounds 1 to 3 makes up the toe portion of the bootie. Rows 1 and 2 will take you through the sole of the foot to the back of the heel. The final rows, 3 and 4, create a heel flap. The heel flap will be sewn in place during the finishing section. Using mc yarn, ch 4 (5, 6). Foundation Rnd: Sc in 2nd ch from hook, sc in next 1 (2, 3) ch sts, 3 sc in last ch. Do not turn. Rotate work 180 degrees. Sc in bottom loop of next 1 (2, 3) ch sts, 2 sc in bottom loop of last ch st, sl st to beg sc to join rnd -- 8 (10, 12) sc total. Rnd 1: Ch 1 (counts as 1st sc), sc in same st, sc in next 1 (2, 3) sts, 2 sc in next st, sc in next st, 2 sc in next st, sc in next 1 (2, 3) sts, 2 sc in next st, sc in last st, sl st to beg ch to join rnd -- 12 (14, 16) sc. Rnd 2: Ch 1 (counts as 1st sc), sc in same st, sc in next 3 (4, 5) sts, 2 sc in next st, 1 sc in next st, 2 sc in next st, sc in next 3 (4, 5) sts, 2 sc in next st, 1 sc in last st, sl st to beg ch to join rnd -- 16 (18, 20) sc. Rnd 3: Ch 1 (counts as 1st sc), sc in each st around, sl st to beg ch to end -- 16 (18, 20) sc. *Repeat Rnd 3 until piece measures 1.75 (2, 2.25)” from toe. Begin working in rows instead of rounds. Row 1: Do not ch. Sc in next 2 (3, 3) sts, turn. Row 2: Ch 1, sc in next 12 (14, 16) sts, turn. *Repeat Row 2 until foot measures 3.25 (3.75, 4.25)” from toe. Row 3: Ch 1, sc in next 8 (9, 11) sts, turn. Row 4: Ch 1, sc in next 4 (4, 6) sts, turn. *Repeat Row 4 for 0.75 (1, 1),” or until the flap is long enough to fold up and meet sides of bootie to close back of foot. Thread tapestry needle with mc yarn. Fold heel flap up to close the back of the bootie. Sew edges of the flap in place. Join cc yarn to the ankle of bootie. Work sc around entire ankle opening as an edging. Space sts evenly (4 sts per inch). If the ankle opening of your slipper comes out too large you can make a single crochet strap and transform them into Mary Janes.